TerryAllen Farms holds a CHSA/CHJA Rated Horse Show each year. The intent of these shows is to give young riders, new riders, amateurs and professionals a chance to compete for awards while trying to improve their skills or the skills of their horses. The 2018 show was a great success and congratulations to all of our CHSA/CHJA medal winners and participants. If you would like to participate in next years show please call us at (860) 585-9018 or e-mail us via the Contact Us page, or stop by the barn and talk to one of our trainers. The Connecticut Horse Shows Association welcomes all riders who seek good sportsmanship and enjoy the thrill of competition. CHSA was established in 1928 to encourage and promote the interest of Connecticut horse shows which include most popular breeds, hunters, jumpers, dressage, driving, English and Western Pleasure and all equitation seats. The Purpose of the Connecticut Hunter and Jumper Association is to promote and standardize all recognized shows and other equestrian activities within the State of Connecticut and contiguous states and to act for the common good of the exhibitors. Every class offered herein which is recognized by CHJA, CHSA & NEHC will be conducted and judged in accordance with their current rules. In order to compete for Annual Awards in these organizations membership is required. Membership is required to enter CHJA & NEHC Medal classes. Membership forms, rule books and class specifications are available at the Secretary’s Stand and also www.chja.net, nehc.info and chsaonline.com. Points shall accrue upon receipt of the completed membership form and dues by the members show Secretary, or the postmark date of mailed application. Non-schooling fee $30.00 for those horse/ponies not shown in horse show. Stabling. All stalls will be on first come, first served basis. The cost is $35 per day. Stalls MUST be reserved by the Monday previous to the show. Stalls are permanent in nature and include doors or gates. SHAVINGS NOT INCLUDED. Arrival time is no earlier than the Thursday before the show at 5:00 PM. ALL STABLING MUST BE PAID IN ADVANCE. Prize money will be awarded at the Secretary’s office following the completion of the division. It is the responsibility of the exhibitor to collect prize monies. The Committee reserves the right to change or vary the courses at their discretion. Warm-Up Classes will be held at the discretion of management, time permitting, at a fee specified in the class descriptions. Schooling before start of show will be held in Jumper Ring only, from 7:30-8:00 A.M.
Management reserves the right to cancel, combine or divide classes if warranted. All entry blanks must be signed by the owner, trainer, rider, or parent/guardian (when applicable) prior to numbers being assigned. There will be an Order of Go for all recognized fences classes which will be posted and strictly followed. If necessary, the management reserves the right to limit entries in classes due to time restraints. Entries will be allowed in such cases on a first come, first served basis. Management reserves the right to adjust the time schedule when necessary. During judging, no one other than the rider(s) is allowed in the ring except on official business. Exhibitors must be in proper attire for all classes. Exhibitors are notified that any discourtesy or disobedience to the judges or officials on the part of an owner, rider or groom shall disqualify the horse, and the owner shall forfeit his entry and other fees. A processing fee of $20.00 applies to all non-negotiable checks. Every animal entered for competition shall be under the control of the Committee, but TERRYALLEN FARMS and CHSA/CHJA will in no way be responsible for any damage that may occur and it shall be a condition of every entry that each exhibitor shall hold TERRYALLEN FARMS and CHSA as well as the Show Committee harmless for any loss or accident which may occur. Should any question or dispute arise, it shall be referred to the Show Committee whose decision shall be final. All exhibitors in the Amateur sections of this show must present their Amateur Certification card before numbers are issued. Measurement Cards. All exhibitors in the Junior/Pony/Children’s Hunter Sections must present their Measurement cards at the Show Office before numbers may be picked up. All Junior/Pony/Children’s Hunters that do not have current Measurement cards will be measured. Measurement time and place will be announced. Post Entries. Post Entries will be accepted up to one hour before the class at regular cost plus an office charge of $25.00 per Rated Division. No Post Entries will be accepted when such entry would require the dividing or re-dividing of a class section. Entries close 48 hours prior to the show. You may enter online or by fax. All classes in rated hunter divisions will be judged on performance and soundness unless otherwise noted. Entry Fees – Flat Classes: $20; Jumping Classes: $25; Medals: $35; Warm-ups: $20; Non-Showing fee: $30 plus office fee and applicable warm-up fees; Champion & Reserve ribbons for each division. BLUE/RED HUNTER Open all day. Score of 76+ receives a blue ribbon, score of 75 or below receives a red ribbon. No prizes for this class, ribbons only. CHSA/CHJA-Open to junior riders who have never shown over fences exceeding 2’6” at a recognized horse show. Riders may show horses or ponies. Fence height 2’0”. At the same show, horse/rider and pony/rider combinations may not cross enter into Children’s Hunter Horse/Pony, Pony Hunters or any class where fences exceed 2’6”. No combinations. CHSA/CHJA-Open to junior riders who are eligible for Children’s Equitation. Open to horses or ponies. Fence height 2’6”. No combinations. At the same show, same horse/rider or pony/rider combination cannot enter any over fence classes exceeding 2’6”. CHSA/CHJA-Open to adult amateur riders who, as of Dec. 1 of the current show year, have not shown in classes with fences 3’ or higher at more than three recognized (CHJA, CHSA) horse shows within the past 2 show years. Riders may not compete in any class at the same show where obstacles exceed 2’6”. CHSA/CHJA-To be shown by junior exhibitors. Junior exhibitors 15-17 years of age must be eligible for intermediate equitation over fences as of Dec. 1 or the current show year. Fences not to exceed 2’ for small and medium ponies 2’6” for large ponies; 3’ for horses; spreads not to exceed fence height. Same horse/pony rider combination cannot show in any other rated division except equitation or pleasure. Horses may be shown by another rider in any other division or section oat the same show. Ponies may not cross enter into the Regular Pony Hunters. CHSA/CHJA-To be ridden by amateurs who are no longer eligible to compete as junior exhibitors. Horses may be shown by a different rider in any other division or class at the same competition. To be judged on performance, soundness, manners, way of going, size of rider to mount and suitability as an Adult Amateur Hunter. Fences 3’ with spreads not to exceed height of fence. Ponies may be ridden by adults, suitability to count. LONG STIRRUP HUNTER & EQUITATION DIVISIONS CHSA-Open to riders 13 and over Fences not to exceed 2’. Riders not eligible to ride in any other classes except pleasure. 18” Fences CHSA/CHJA-Open to riders 12 years of age and under who have never competed over fence exceeding 18” in a recognized show. Riders competing in this division may not compete in any other class in the show where obstacles exceed 18” in height. Course not to exceed 8 fences. CT TRAINING HUNTER CHSA/CHJA–Open to all horses or ponies. No age limitations and no rider restrictions. No restriction of horse/pony/rider into other divisions if otherwise eligible. To be judged on performance, soundness, suitability and manners. Simple lead changes and/or trotting in corners is permitted. The same horse/rider combination may not compete in more than one section at the same show. CHSA-Riders 10 years of age and under who have not competed in any class requiring them to canter or jump at a recognized show. Riders may not compete in any short stirrup classes. Will be asked to walk and trot in both directions of the ring. Judged on position and ability to control their mount. Diagonals considered. CHSA/CHJA-Open to all riders 10 years of age and under who have not competed in any class requiring rider to canter or jump. Horses or ponies to walk & trot both directions of the ring. Judged on manners, suitability, performance. Riders ineligible for Short Stirrup. CHSA/CHJA-Open to riders 12 years and under who have never competed over fences exceeding 18” at a recognized show. Riders may not compete in any other recognized division or recognized class in a show with fences exceeding 18” with the exception of pleasure and pet-type pony classes. CHSA/CHJA-Open to junior riders who have never shown over fences exceeding 2’6” at a recognized show. Riders may show horses or ponies. At the same show, riders may not cross enter into Children’s Eq, Children’s Hunter, Pony Hunter, any Medal Class over 2’0”, or any class where fences exceed 2’6”. Fence height 2’0”. No combinations. CHSA/CHJA-Open to adult amateur riders who, as of Dec. 1 of the current show year, have not shown in classes with fences 3’ or higher at more than 3 (USEF, CHJA, CHSA, NEHC) horse shows within the past 2 show years. Riders may not compete in any class at the same show where obstacles exceed 2’6”. CHSA/CHJA-Open to riders who are eligible for Children’s Hunter, have not shown over a course where fences exceeded 3’ at a recognized show and have never shown in the CHJA Junior Medal Finals. Fences for horses and large ponies 2’6” and 2’0” for small/medium ponies. CHSA/CHJA-Open to all Junior riders that have not reached their 18th birthday. Riders cannot cross enter into the Children’s Eq Division. Fences not to exceed 3’. CHSA/CHJA Open to amateur riders 18 years old and over. Fences to be 2’9” to 3’. MEDAL CLASSES CHSA/CHJA-The classes consist of two phases, the first phase to be shown o/f. At least six competitors, if available, to compete in the second flat phase, each to count 50%. To fill a class, four members must compete both phases of the class. Open to members and non-members, but only members will accrue points. At least three riders must compete in the class. Two tests (USEF 1-8) to be included in each course. 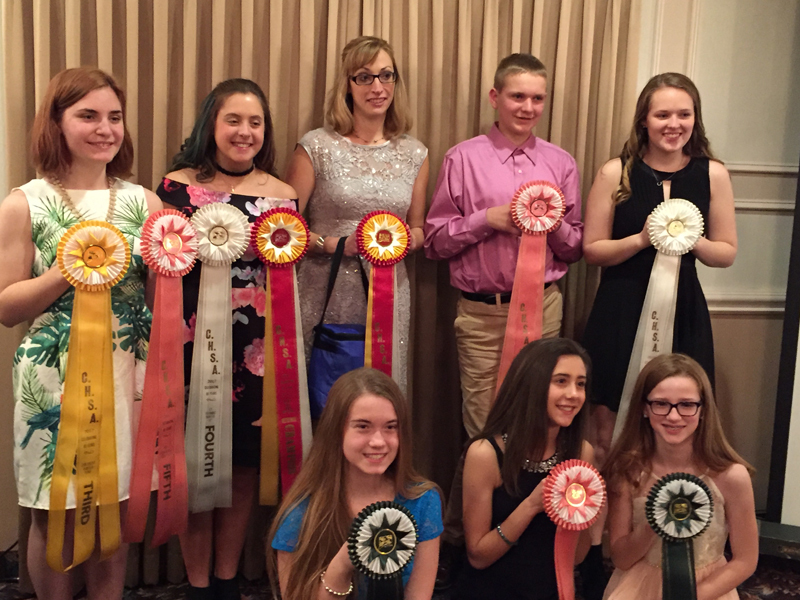 Riders may compete in only one CHSA Medal class per show. CHILDREN’S MEDAL CHSA/CHJA – 2’6” Open to juniors eligible for Children’s Hunter and who have not shown over a course at a Recognized show where fences exceeded 3”. If you have ever qualified for or shown in a 3’ Equitation Final, including CHJA, you are not eligible for the Children’s Medal.